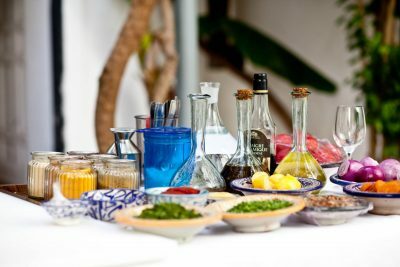 The excellent chefs of our riad contribute to your well-being with a large variety of traditional Moroccan and international dishes. 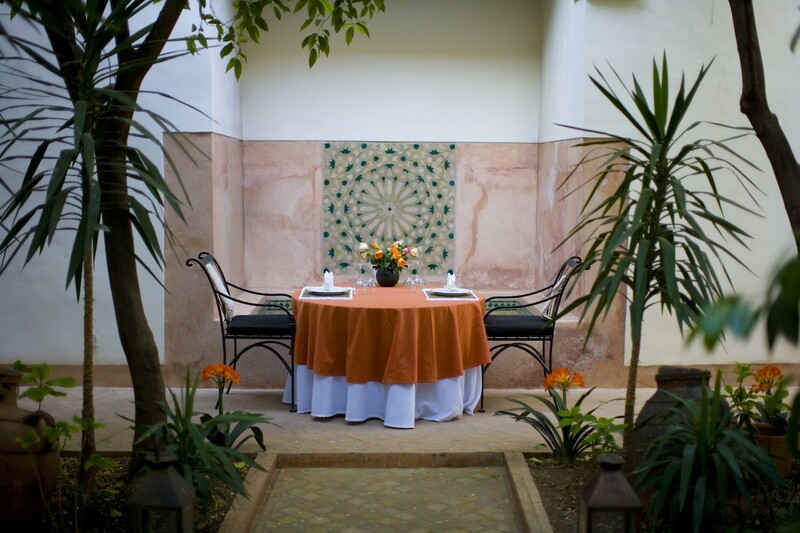 From spring to autumn our restaurant tables are being set outside in the main patio of our riad or on the roof terraces with view on the roofs of Marrakech – please let us know your choice. 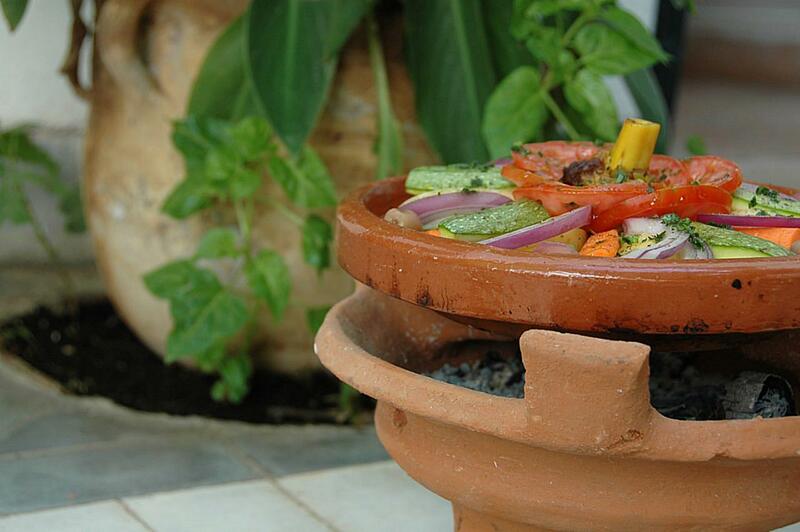 We serve steaming tajines, exotic salads – the most delicious examples of Moroccan cuisine – underneath citrus trees heavy with fruits or in full bloom or with a great view. During colder periods in Marrakech, we invite you to have a seat in our indoor restaurant next to a crackling and warming fire. Under the high ceiling of the former kitchen with a glass pyramid opening to the sky, our restaurant team is happy to be at your service. 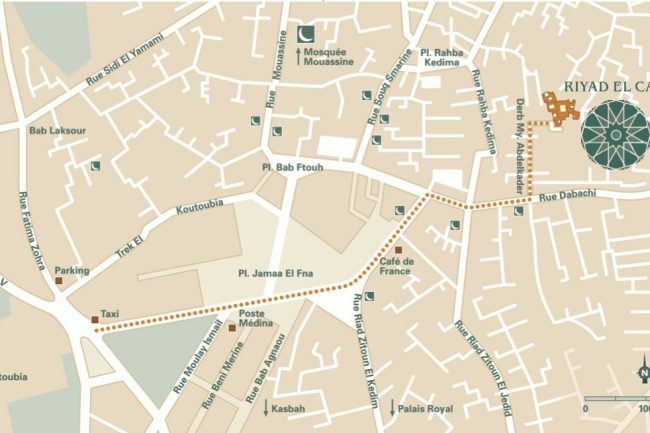 You are most welcome to enjoy a delicious meal at Riyad El Cadi even if you do not stay with us. We kindly ask you to let us know a day in advance of your wishes so that we may be well prepared. We are happy to answer to your dietary requests (vegetarian meals, special allergies, children’s food). If you choose to have a change from the Moroccan cuisine, our chefs are happy to prepare you delightful International dishes. The Moroccan cuisine suits especially well the requirements of a gluten free diet and a diet necessary for lactose intolerances. Please be so kind to inform our restaurant team if you should wish any special requirements. You may book your stay with full board or half board. Full board with dinner and lunch is available at 450 DH (approx. 41 EUR) per person and day, half board at 280 DH (ca. 26 EUR) with dinner (3 courses). As you wish à la carte. You are most welcome to book your table even if not staying with us. 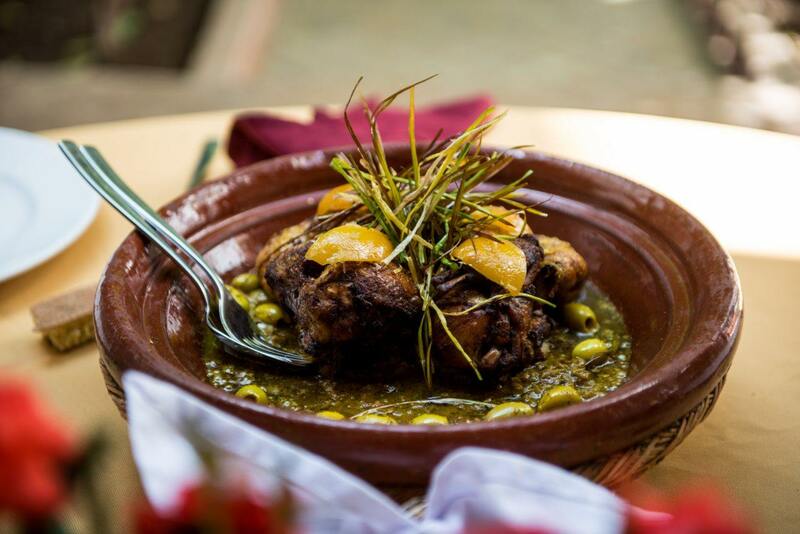 The Moroccan cuisine is labourious and time consuming: the second course consists of a choice of different salads, the grains for the couscous need long kneading and the tajines slow cooking. 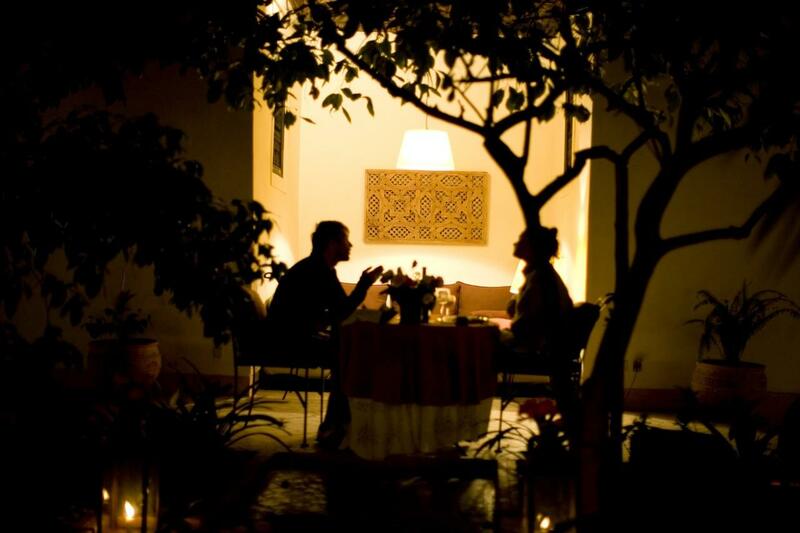 We therefore kindly ask you to book a table and let us know your wishes in advance. Or enjoy the full meal. Do you like to do it on your own? 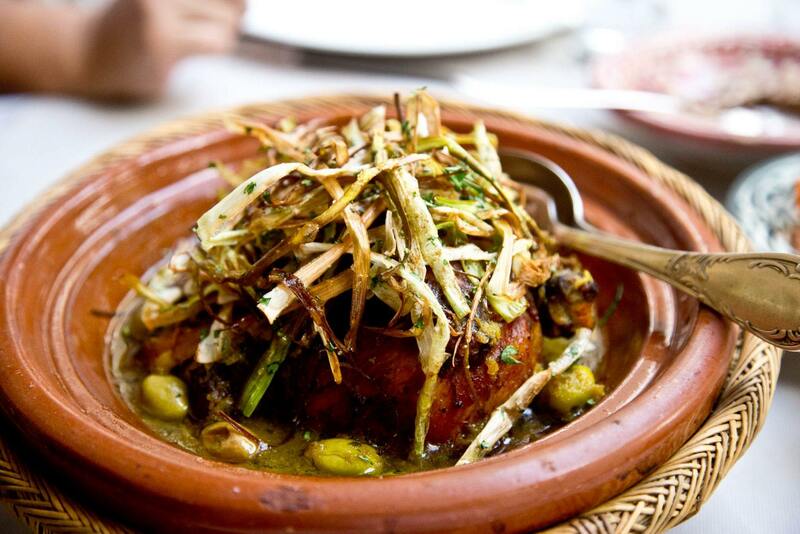 Cook a tasty Tajine? 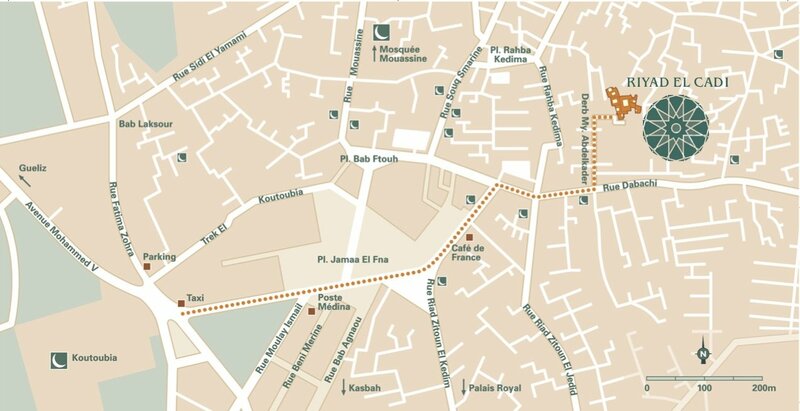 Like to know where the locals in Marrakech shop? We show you all in our cooking classes. 50 EUR per person including course, lunch, tea and a glass of wine.